There's one last thing I wanted to show you before the festivities begin. Well, four last things actually, but as they are all the same sort of thing and I'm running out of time, I've decided to clump them all together into an end of the year grand finale type thing. First up is my solution to a problem that's been bothering me for years. 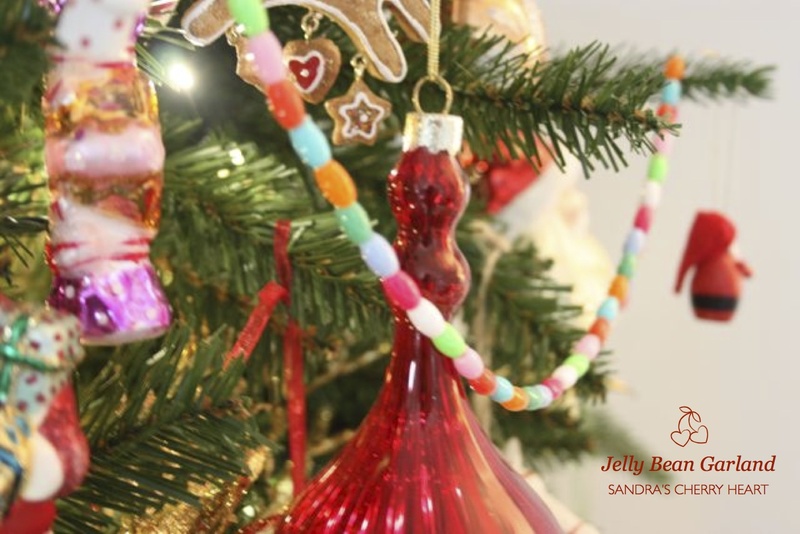 Many moons ago, on a 'Sparkly Trip' I purchased a garland for my tree which consisted of a string of beads, coloured and shaped, so it appeared to me, to ressemble Jelly Beans. Well, I have loved this garland very much ever since. Loved it so much in fact I continually wish I could give myself a good kick in the pants for not getting more than one of the delicious things at the time. I have hunted high and low for something like it ever since and drawn a blank. It is only this year it occurred to me to make my own. (Yes, I can be very dim.) I sat in front of the trusty computer and was rewarded by finding some beads that were remarkably similar to what I required and I was ecstatic. A couple of weekend's ago my Little Miss and I sat and spent a jolly hour or two stringing them up. A happy and easy task for us children of all ages to enjoy, and now my Christmas tree is reaping the benefit. 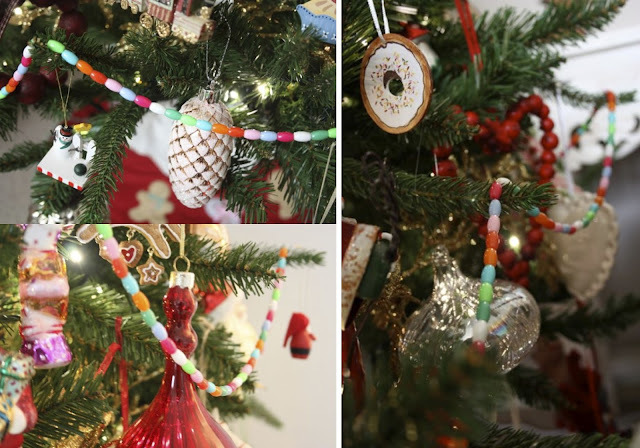 I can't tell you how happy I am to see those little coloured beads hanging in a row. Sigh... yes, very happy. Next up are two little garlands that have been inspired by trips around Blogland this year. I've seen lots of beautiful pom-pom garlands and lots of lovely red and white twine and a fair quota of adorable silver bells. I decided I needed some of these objects of beauty in my home too. Queue some more playing with Fimo. 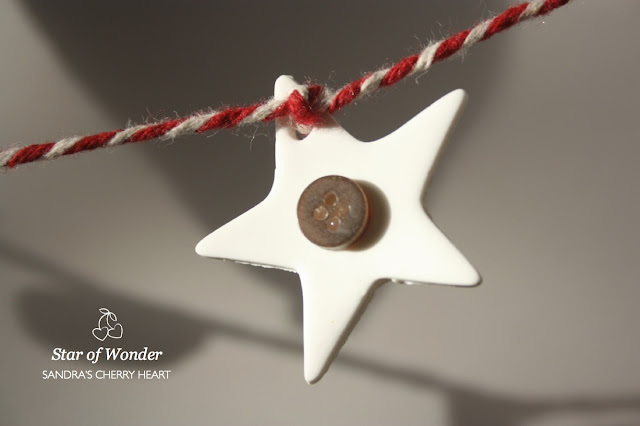 That's what the little white stars are made of. Easy peasy cut shapes and bake, a glue gun to add a button, some silver bells (from Ebay) and some bakers twine and a simple but very Christmassy garland was born. Then, my laziness kicked in again because, despite owning those clever little knick knacks that make pom-pom making quick and easy I decided I wanted quicker and easier still. I fancied a circle shape and didn't want to fork out a fortune for all the felted balls that I'd need to make a decent size garland. So, crochet to the rescue! I devised a little disc shape and a handy dandy method for linking them together and picking my favourite Christmas colours of the moment, I spent a few evenings hooking myself up this little beauty. That mantle is getting a little crowded now isn't it. I still love it though. Fear not good people, we are almost there. Only one thing left to share and it's as cute as a button. Those bits and pieces in the picture at the top are coming into play now. You were no doubt wondering when I was going to mention them. This garland, which you'll probably guess if you've been hanging around here very long, is inspired by the great, good and exceptional talented Amy of Nana Co. (Yes, again.) I love her, what can I say! The Fimo makes a feature again here, that's what the hearts are made from, but I've also had some fun with felt. Felt and fabric, buttons and sequins, what happy play things. I didn't really have an end result in mind when I started this one. I just started trying things out and the plan formed as I played. Looking back at Amy's glorious garland now, I'm happy to see I didn't copy it too shamelessly. The candy canes are a complete lift of course, but I see I've also 'made it my own' as they say with the holly and gingerbread houses. The hearts were a last minute addition when I came to thread everything up. I'm glad I used them though, they seem to pull it all together somehow. I can't take credit for thinking of it at the time but the red and white working with the candy canes I suppose is what does it. Well, I hope you enjoyed my plethora of Christmas garlands and my 'Grand Finale' of festive creativity for the year. Have a wonderful and joyful Christmas. 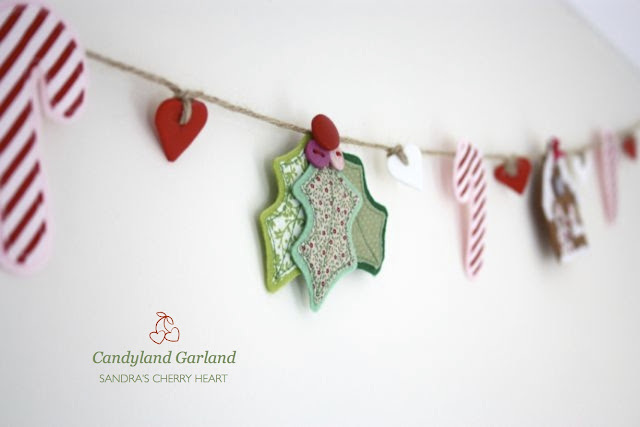 Love your garlands - so sweetly simple and colourful. I'd be tempted to leave them up long after 12th night! And you know I can think of many things I regret not buying more than one of. Sometimes I think I'd be greedy to buy all of something pretty and I should leave some for others - but I bet those others wouldn't have appreciated the pretties as much as me! I certainly enjoyed browsing your 'Grand Finale' of festive creativity! I especially love the holly, candy canes and gingerbread decorations, reminiscent of your side-bar decoration that I already admired! Everything looks wonderful and festive and happy! I liked the mummy/daughter collaboration on the jelly beans garland! 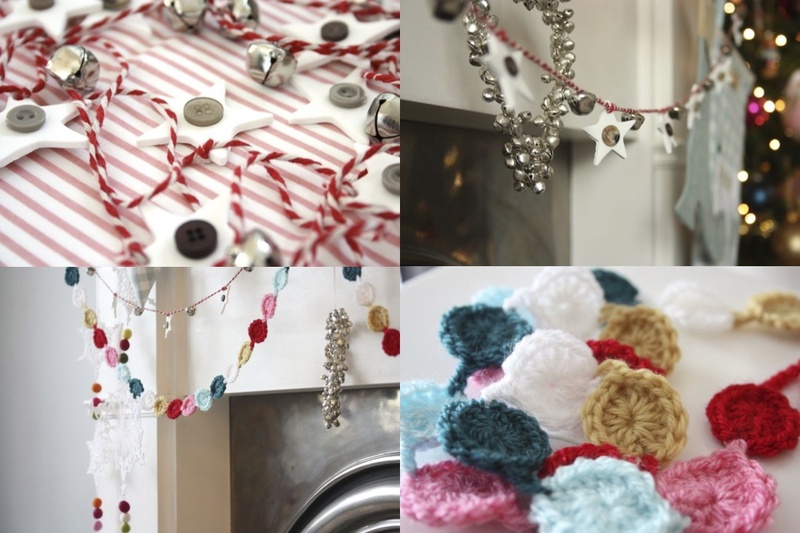 I especially love the felt garland! 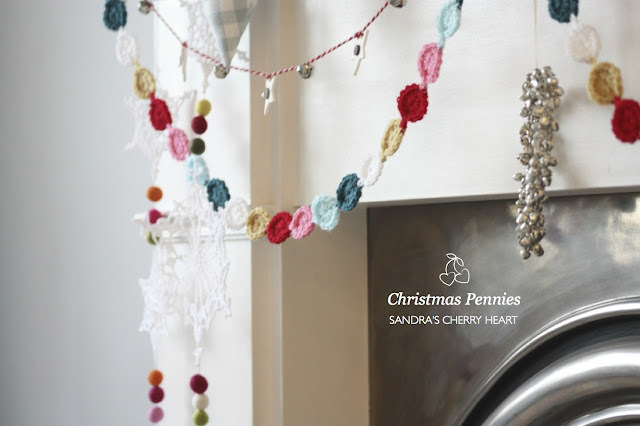 Your home is so Christmassy and lovely Sandra! Each one of your garlands is cute, but I especially like the felt one. 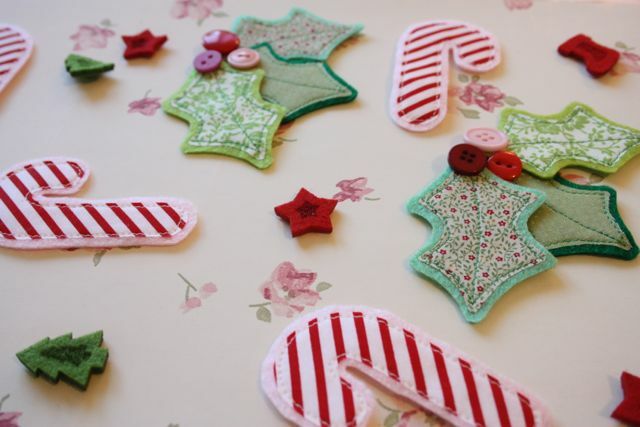 I'm partial to all things made with felt and love to play with it too. Hi Sandra! 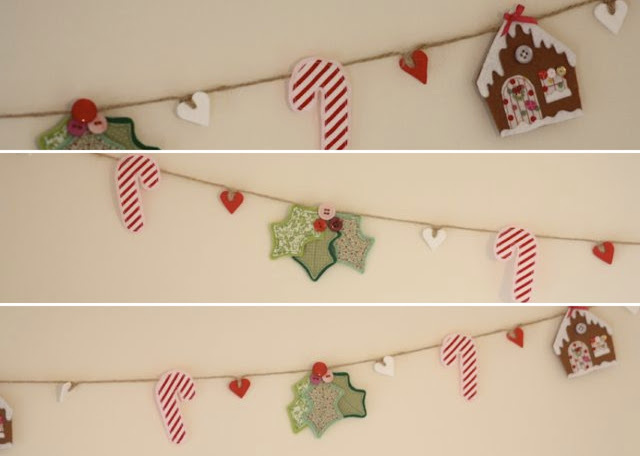 I'm totally in love with your garland, I've got red & white fimo and it's never occurred to me to use it like this :) Love love love your Gingerbread Houses, they're so cute and detailed! I love your all your garlands. I don't have a singel one in my house, but I am seeing them everywhere and really think I should make some for next year. Wonderful blog and post,Sandra. Followed you from another. 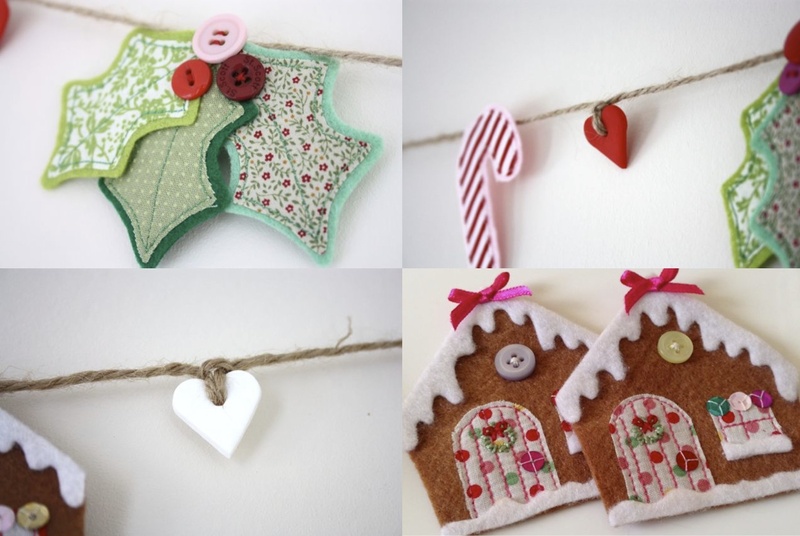 Love your holly garland and houses, so festive! Will visit you again, soon! Hi, das ist wunderschön und war eine ganze Menge Arbeit. Aber es hat sich gelohnt, deine Weihnachtsdeko ist sehr hübsch, großes Kompliment! Ich grüße dich ganz herzlich und wünsche dir und deiner Familie ein gesundes neues Jahr, Anne.